The above passage is an excerpt from the parable of the sower, taught in Matthew, Mark, and Luke. We know, from all three accounts of the parable of the sower, that people represented by soils two through four believed in Christ as Savior, and therefore received eternal life that could never be lost or forfeited. But, most Calvinists and Lordship “salvationists” (LSers) will steadfastly deny the clear word of God regarding the spiritual position of believers represented by soil two (Luke 8:13). In his parable about the different types of soil, Jesus spoke of a group who heard his word and made an initial, encouraging response of belief, only to fade away over time. These are those, Jesus explained, who hear the gospel and respond positively to it—pray the prayer, walk the aisle, get baptized, or do whatever new converts in your church do. They remain in the church for a period of time. But they do not endure when the sun of persecution comes out and will not in the end be saved. Greear’s comments are indicative of the mainstream of the Calvinist/LS community that prefers the teaching of men even when it contradicts God’s clear word. In this case, it is belief in the false Calvinist tenet of “perseverance of the saints,” which maintains that all “true believers” will persevere until the end of their lives in faith and some degree of holiness. The irony of Greear’s comments is that LSers are represented by either soil one or soil two. “But you see, Satan blinds the minds of people by giving them a heavenly way to go to hell. And the most dastardly of all false gospels is what we call Lordship “salvation” or discipleship “salvation.” Who says ‘Jesus is necessary, but He’s not enough.” You must also be committed and follow the Lord if you want to get to heaven. That’s mixing grace and works. It does not save. It only further deceives people and makes their blindness deeper, and deeper, and deeper. Be careful! Be careful! But, not all people who have fallen for false gospels, including LS, are unsaved. Some are those represented by soil two, who once believed in Jesus as Savior, but have fallen away. Such people may be actively involved in Church, trying to lead Godly lifestyles. Others may have “thrown in the towel” and given up on Church and Christianity altogether. We simply cannot know whether those who have fallen for false gospels such as Lordship “salvation” are saved (soil two believers) or unsaved (soil one). Either way, they need to be introduced, or re-introduced to the truth of the gospel. Lordship Salvation: Is THEIR Report OUR Report? Romans 10:16: But they have not all obeyed the gospel. 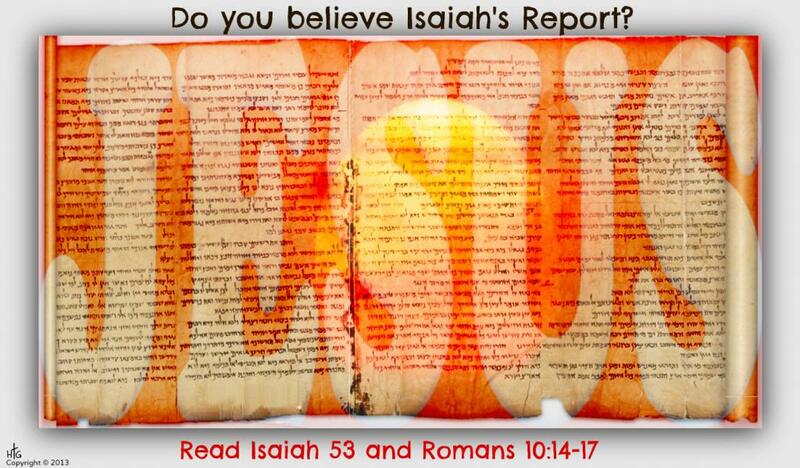 For Esaias saith, Lord, who hath believed our report? We were recently meeting with some Christian friends, who mentioned that a prominent writer would be appearing at a local megachurch to make the case for Christianity. This writer’s book makes the case for Christianity by describing how much faith it would require to be an atheist. That is a great topic for a book, and for attendant lectures. But, let’s look at a little bit of background on the teachings of the church (Forest Hills Church, Charlotte) hosting this event. Do you believe in me today? Do you believe I came from heaven, lived in human flesh as a man, lived the perfect life you’re incapable of living, died for your sins and rose from the dead to prove your righteousness and grant you eternal life? It’s a free gift, given by grace through faith. Accept this gift. Believe in me. Trust me for your eternal life. This is a terrible Calvinist “perseverance of the saints” message that is entirely unbiblical. It is an affront to the real gospel message. If good deeds prove the presence or absence of faith, then one must look at himself to determine if he is saved. Is the person teaching that the Bible is reliable reliable? Or, are they setting records (attendance, book sales, etc.) by changing the record? If you’d like a more in-depth explanation of our doctrinal beliefs, you may want to read The Baptist Faith and Message. This statement of “faith” requires that someone be regenerated before believing (unbiblical), defines repentance as “a genuine turning from sin toward God” (unbiblical), and thereby makes Jesus necessary for salvation, but not sufficient. In the false gospel presented in the Baptist Faith and Message, Jesus’s work on the cross, and His victory over sin and death must be augmented by our works – in this case turning from sin. This is not the record that God gave of His Son. And it is not a message that will save anyone. Have you believed OUR report? Or have you believed THEIR report? Eternal salvation is a free gift, available to every person on the same basis: by grace alone through faith alone in Christ alone. We are saved by grace alone through faith alone. But, the faith that saves is never alone. I heard this song today for the first time, and it reminded me of where I come from. I was raised in the southeastern US, and North Carolina is where I currently live. I like fried chicken (sorry PETA) and cornbread. I feel most at home when I’m here. And, I used to think I had to work to get to heaven. Let me take a moment to explain what I mean. I am a 53 year-old man that didn’t become a believer in Christ until age 49. As far back as I can remember, I believed that Christ was the Son of God, that He died for our sins, and was raised from the dead. Until just a few years ago, it had never dawned on me that faith in Christ and faith in Christ plus me were mutually exclusive. Resolving to turn from sins and committing one’s life to Christ are works. We cannot be saved by our works. Romans 3:20: Therefore by the deeds of the law there shall no flesh be justified in his sight: for by the law is the knowledge of sin. Most churches, evangelists, and print ministries teach Lordship “salvation” either explicitly, or implicitly. It is appealing to us, because it fits into our preexisting belief that we can somehow work our way back to God. LS is the unsupportable belief that the PERFORMANCE of good works, the PROMISE of good works, or the EVIDENCE of good works MUST accompany faith in Christ in order to establish, or provide evidence, that such faith has resulted in eternal life. LS can be overt (one must forsake all of his sins and follow Christ in obedience and discipleship in order to be saved) or VERY SUBTLE (one’s behavior will change once he is saved). But, do not be deceived. Trying to add ANY human merit to Grace makes it no longer Grace. (Romans 11:6). Anyone who is a Christian has repented (changed his mind) from some false belief to belief in Christ alone as Savior. For me, I had to repent (change my mind) from thinking that my good intentions had any bearing whatsoever on whether or not I was going to go to heaven. We receive eternal life when we stop working for it, and believe in the person and work of Jesus Christ alone. Romans 4:5: But to him that worketh not, but believeth on him that justifieth the ungodly, his faith is counted for righteousness. LS is where I come from. Belief in Christ is where I am now. God never gave up trying to draw me to him. God has not given up on you either. How do I know? I know, because you are reading this post. Dr. Cucuzza makes the point that the thief on the cross is a type of all of us. This is a critical point, because all of us were condemned before we believed.